Governor Nyesom Wike of Rivers State has accused some unnamed Peoples Democratic Party Presidential aspirants as stooges of the ruling All Progressives Congress, APC. He said the APC planted them in PDP to foist confusion. 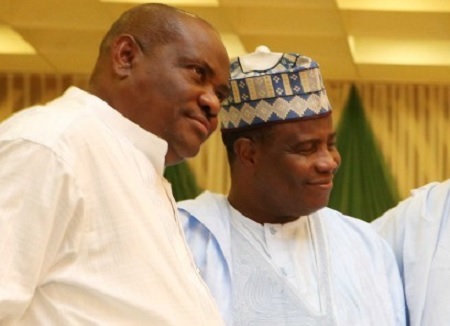 Wike reportedly made the allegation in an interview with an online medium, where he said the opposition was aware that some of those jostling for the PDP presidential ticket were being sponsored by the ruling party and the Presidency. Wike said in the interview: ”Those who are complaining about me are those who are afraid because they are the agents of APC. We know those APC presidential aspirants who are agents of PDP. We know them. The Presidency and the APC have planted people within our party, and we know it. Though, Wike did not name such aspirants, but some of the aspirants in the PDP are: Former Vice President Atiku Abubakar; former Kaduna State governor Senator Ahmed Makarfi; Dr. Datti Baba Ahmed; former Jigawa State Governor Sule Lamido; former Sokoto State Governor Attahiru Bafarawa; ex- former Plateau State Jonah Jang and former Jigawa State Governor Sule Lamido. Others are former Senate President David Mark; Gombe State Governor Ibrahim Dankwanbo; former Kano State Governor, Senator Rabiu Musa Kwakwanso; former Minister Tanimu Turaki; Senate President Bukola Saraki and Sokoto State Governor Aminu Tambuwal. The APC yesterday rejected the claim and advised the PDP to leave it out of the challenges of choosing a presidential candidate from its deluge of aspirants. APC National Publicity Secretary Yekini Nabena according to The Nation said it will never descend to the level of planting aspirants in any party as, according to him, was the tradition with the PDP when it was in power. The APC spokesman said: “That is not true. We will never descend to that level of planting people in the PDP. We all know that they were the ones planting people in the past. We have no business with whatever they are doing. “The PDP should face their problems and address them. We have better things to do than think of how to plant aspirants in their party. The people that left our party for the PDP were those they planted in the party and when they failed to achieve their aim of destroying the party, they left. “So, the PDP should face its problems and leave us out of it. We have nothing to do with the party and its aspirants”. Later in a statement last night, the ruling party challenged the PDP to name such aspirants, adding that the PDP in its despair over its failed 2019 election bid for the presidency has resorted to comical conspiracies. The statement, signed by Nabena, said: “Instead of putting its house in order, it is laughable that Governor Wike and his PDP cohorts are clutching on straws in their desperate bid to remain in public reckoning in the face of imminent 2019 defeat.